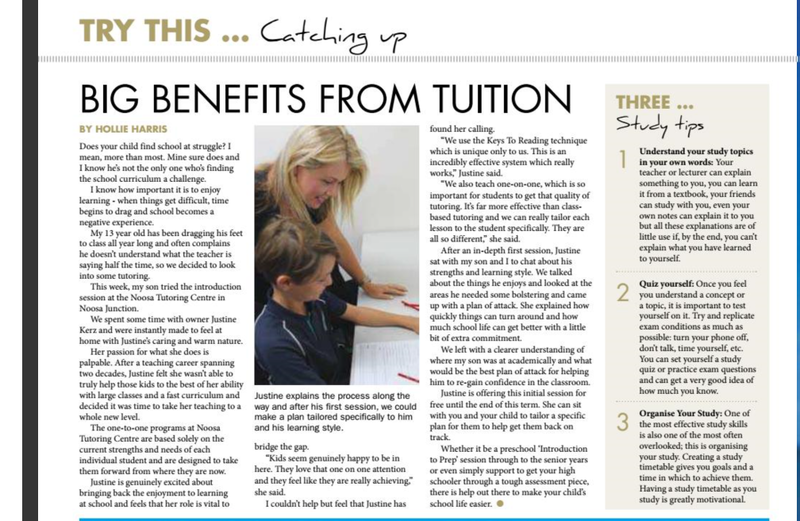 Learning at Noosa Tutoring Centre helps students reach their full potential. Noosa Tutoring Centre’s ‘one to one’ programs are based on the current strengths and needs of each student. Our learning programs take each student forward from their current base of knowledge. All individual sessions develop your child’s confidence and proficiency. Our experienced teachers teach specific strategies in reading, writing and mathematics. Every student’s learning and progress is monitored by our director. We communicate regularly with parents and schools. We have proven results with children who are making limited progress in reading and writing in the first years of school. Different programs are available to meet the individual needs of the student. Our teachers are selected for the knowledge and experience. Programs are specific from Pre-School to the Senior years. Session times are available during and out of school hours. Every time your child comes to our centre they will have the same tutor who knows their strengths, weaknesses and the way they learn. Go to the Programs section of this website to see the learning options available. Call Noosa Tutoring Centre for an appointment. Go to our Contact page to send an enquiry form.